Would you like to present your research at one of our upcoming events? We are looking for exciting and engaging ways of uncovering your research. This might include individual presentations, presentations in pairs, in conversation/dialogue, or presenting a group project.We are now programming for our summer and autumn library talks season and are looking for relevant proposals. 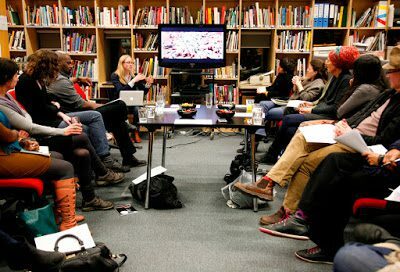 The Stuart Hall Library Research Network is a forum for researchers, artists, academics, curators, students and activists to introduce an aspect of their work. It is a meeting place for the discussion of practice-based or more conventional forms of research that may include: visual arts; film and media; curatorial practice; cultural studies; cultural activism; postcolonial studies; literary studies, including criticism and theory. This is not intended as an exhaustive list and all presentations on practice or research that in some way resonates with the activities of Iniva are welcomed. We also welcome proposals which are suitable for our Clothes, Cloth and Culture Group which looks at textiles and dress as part of wider visual culture from a decidedly cross-cultural perspective. There is no fixed deadline but proposals are sought as soon as possible.